Russia has been a central part of the respective election campaigns of U.S. presidential candidate Hillary Clinton and Donald Trump, with the former in particular outspoken in her criticism of the Kremlin, but is there any real substance to this demonization by the Democrats, or is it pure election rhetoric? There are two months to go until the U.S. presidential elections. 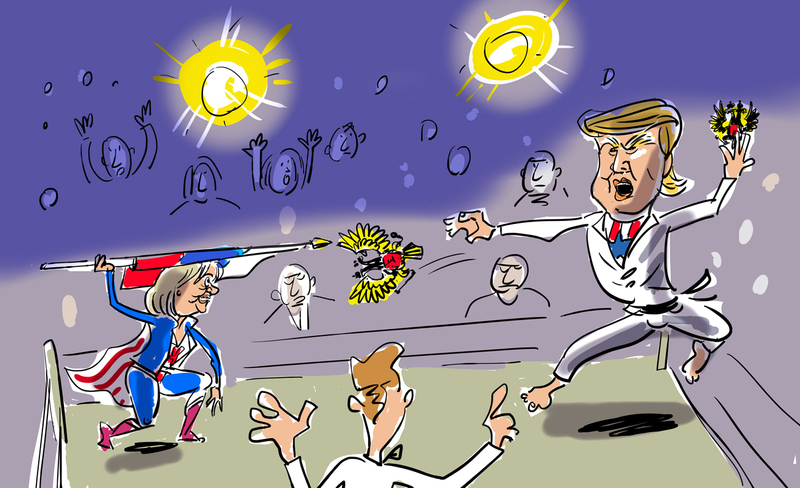 The current campaign has revealed many amazing things and one of them is the unprecedented – since the collapse of the USSR – presence of the Russian issue in election debates. Speaking at the end of August in Reno, Hillary Clinton attacked Donald Trump's "alternative conservatism." According to her, the "alternative" candidate encourages intolerance, xenophobia and racism. And the "grand godfather of this global brand of extreme nationalism" is Russian President Vladimir Putin, she stated. This perhaps is the Russian leader's most prominent standing so far in the election campaign. Up until now he had faced concrete accusations such as hacking into the DNC's server. But now the scale of evil that Russia embodies is growing before our eyes. On Sept. 5 The Washington Post wrote about the Kremlin's intention to "to cause chaos and provide propaganda fodder to attack U.S. democracy-building policies around the world, particularly in the countries of the former Soviet Union." The newspaper admits that the special services do not have any evidence of "Russia's plans" to do something similar, but then reminds its readers that "the Russian government hacked the Democratic National Convention" but officially "the U.S. government has still not accused Russia of the act." Before, in such cases, at least for decency's sake, the word "supposedly" would be added, but now such an accusation against the Kremlin is considered an axiom. If everything is starting off with such bravura, it is reasonable to expect that the tension will only increase the closer we get to election day. Sept. 26 kicks off four rounds of direct debates and it seems that the Russian card will be played there as well. The hysteria of the current American presidential campaign, especially on the Democrats' side, is rather incredible. It is particularly astonishing given the polls, which are not very worrisome. None of the leading analytical institutes has any doubts of an Clinton victory – most of them give Clinton at least a 70-percent possibility of winning. However, commentators and analysts are worried about symptoms that may blow up in the weeks running up to election day. The most anxious signal is the noticeable fall in Clinton's popularity after August's national convention. According to a CNN/ORC survey, Trump took a two-point lead over Clinton in the first days of September – 45 to 43, even though a month earlier he was trailing by 8 points. Also, according to the survey, in the economic sphere 56 percent of Americans trust Trump and 41 percent Clinton. In terms of the fight against terrorism, this is 51 percent for Trump and 45 percent for Clinton. But in issues concerning foreign policy 40 percent trust Trump and 56 percent Clinton, a clear advantage for the Democrat. The secret to why Russia has exploded onto the election agenda is perhaps to be found in the latter. Foreign policy is (perhaps the only) sphere in which Hillary Clinton, with her experience and her membership in America's political aristocracy, has the upper hand. In any case, Trump, with his devil-may-care recipes that contradict the established line, is an easy target to attack, and Clinton will no doubt do just that during the debates. In essence, Trump's neo-isolationism resonates well with social moods. Surveys have long been identifying a weariness from the imperative of "global leadership." However, the billionaire uses very primitive schemes and this is not appreciated by those who think that international affairs demand much skill and finesse, which Trump obviously does not possess. Be that as it may, Clinton's campaign tactic is fully rational: increase the scale of foreign threats in order to demonstrate the Republican candidate's lack of professional ability. What do the U.S. presidential candidates think about Russia? Trump is relying on his strength and decisiveness, as well as on his ability to speak to Putin "man to man." And here lies diabolic cunning and a wily plot that even the Soviet KGB couldn’t dream of. How can a simpleton from Queens like Trump compete with "the supreme godfather?" By the way, the deeper the discussion is led into the jungle of "existential threats" to American democracy, the fewer questions will be asked about the contributions to the Clinton Foundation or about Hillary's success as secretary of state, which raises doubts. Let's hope for now that the demonization of Russia, unprecedented in American presidential elections, is just an instrument, something that is nothing personal. However, knowing all that we know about Hillary Clinton's views can only lead us to suppose that something personal will also be thrown into the ring.